Offer a discount for buying in multiple quantities (e.g. buy one, get one), boost sales through pricing incentives, and still collect information at an individual attendee level, if you’d like. 1. Go to your Edit page. After logging in and creating an event, find your event on the Manage Events page, then select “Edit”. 2. Create a new ticket type to accommodate your group discount. NOTE: Keep in mind that the price you set for your ticket will be multiplied by the number of tickets in the group or package—to equal the total price for that group or package. 3. 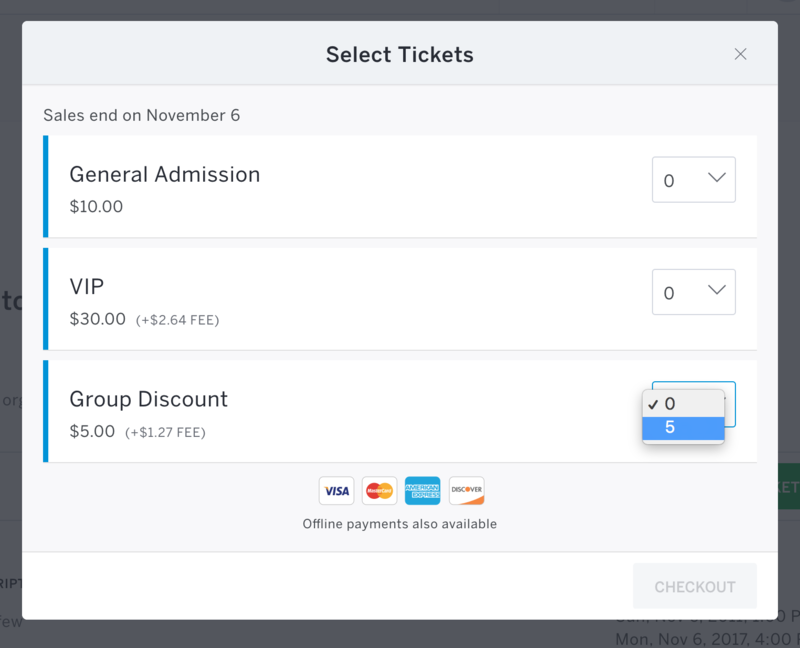 Set the minimum and maximum number of tickets per order to support your group discount. Click the Ticket Settings action gear to the right of your newly-created group discount ticket. Then adjust the “Tickets allowed per order” to match the number of attendees in the group. EXAMPLE: For a “Group of 2” ticket, the minimum and maximum tickets per order should be set to 2. TIP: It may be helpful to utilize the “Ticket description” box to clearly identify the savings that your attendees are receiving or to include any other relevant information about that particular ticket type. If you add any information here, you’ll also want to select the “Show description on event page” box for the description to automatically appear below your group discount ticket on your event page. NOTE: The minimum and maximum tickets per order values can be set as low as “1” or as high as “100”. Congrats! Your new group discount ticket is ready to promote!